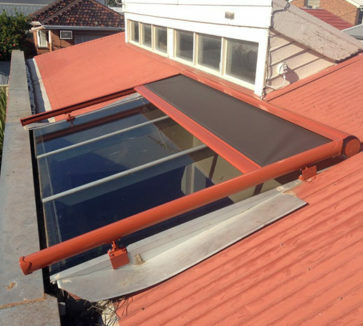 A conservatory or glass roof in your home can be great in the winter months but when the weather warms up, the build up of heat renders the room unusable unless the glass is protected from the sun’s glare.Installing blinds on the inside of the glass will prevent the sun’s rays from reaching you but sadly the heat has already got through the glass, creating a thermal effect heating up the room, which in turn means more work for your air conditioner and in turn more expense to you. Exterior conservatory blinds prevent up to 95% of the sun’s harsh rays from ever reaching the glass which in turn means you can still use the room during the summer months. Many different types of fabric can be used but possibly the best fabric to use is shade mesh. Shade mesh fabrics cut out up to 95% of the harmful rays but still allows good visibility and enough light in to give you that open feeling. The fabric on conservatory blinds is always under tension so it doesn’t matter whether you have the blind fully out or only out halfway, the fabric does not flap around..
Conservatory blinds offer you the flexibility to choose just how much light your room or alfresco area is getting. While the scientifically-designed shade mesh blocks out 90%, 95% or even 99% of harsh, summer glare, the structural integrity and tension of our exterior conservatory blinds means that you can have them open as much or as little as you want. With an easy to operate motor system, you can move your blinds throughout the day, as the sun moves, and maintain your optimal temperature with little effort. In terms of providing an energy-saving cooling solution that also looks great, you can trust Coolabah Shades for high-quality, low-cost alfresco blinds. Melbourne winters can get very cold, and many Melbourne homes are built to retain heat for this exact reason. The problem is that when summer hits, many houses are under threat of becoming overheated, leaving rooms and conservatories all but unusable. Conservatory blinds offer the best of both worlds. Leave them wide open in winter to maximize your natural light or keep them shut in summer to reduce overheating – and anything in between. And while our premium shade mesh protects your family from harsh sunlight, it allows just enough light through to ensure your alfresco areas retain their open, outside feel. While curtains or shutters can block out light and heat, only shade mesh acts as a partial barrier. Enjoy the benefits of natural sunlight without the harsh UV rays and unbearable heat. Our shade-mesh conservatory blinds can be installed quickly and easily so you can enjoy these benefits right away. Want to block out sun without giving up your views? Like sunglasses, our conservatory blinds allow a clear view while reducing harsh, direct sunlight and glare. With its easy-to use operating system you’re only ever a few seconds away from escaping the harsh Aussie sun. Our team of expert installers will help guide you through how to operate your very own conservatory blinds. Simple, quiet and environmentally friendly, alfresco blinds are a fantastic alternative to other, conventional cooling systems. 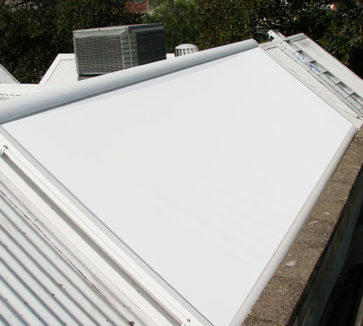 When it comes to alfresco blinds for Melbourne homes, Coolabah Shades have the range and installation expertise to offer you affordable, energy-efficient shade solutions.